When Downbeat began its critics poll the category of “rising star” didn’t exist like it does today. Back then it was called “talent deserving wider recognition.” As somebody who votes in the poll, I prefer the latter category, as the definition of “rising star” can mean a whole lot of different things to different people. One of this year’s oddities was Julian Priester getting a significant number of votes for “rising star” trombone, even though he’s been on the scene for decades and has played and recorded with many of the all time greats. If the category “talent deserving wider recognition” was still around, Priester’s placement near the top would have made more sense. Which brings me to this post’s point: every jazz fan has their favorite bunch of musicians who they feel deserve wider recognition. Some of these might be players on their local scene, people they’ve just discovered, or perhaps people who have been around forever and who haven’t received as much attention as maybe they have deserved. For those of you like me who weren’t already aware of guitarist Avi Granite, you would do well to add him to the list of talent deserving wider recognition. And add his recent album Snow Umbrellas to your list of albums to dig into. 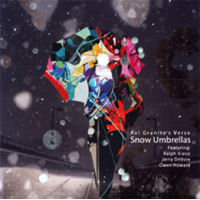 Snow Umbrellas consists of nine original compositions by Granite performed by his quartet, which includes trumpeter Ralph Alessi, bassist Jerry DeVore, and drummer Owen Howard. Alessi, who I’ve only heard on a handful of other albums, is himself someone who deserves more praise. There is a lot to like on this album. The trumpet/guitar/bass/drums configuration presents a seldom heard combination of colors; the configuration works so well here it’s surprising that there aren’t more groups with this instrumentation. One of my favorite things about the record is how understated the writing and playing is. Granite’s tunes and arrangements leave a lot of open space where everything can be heard, which leads to a situation where there is a lot that is implied rather than overtly stated. For the most part the tracks stay in the medium tempo range, although the bulk of “Four for 4” is free and the album’s concluding track, the haunting “Barnacles,” is quite slow. One of the disc’s defining qualities is that the group keeps things nice and relaxed. This approach is immediately apparent on the opening track “O Blues.” Granite’s comping behind Alessi’s fairly long and winding solo lines is fairly minimal, placing soft chords into spaces, which often echo or compliment Alessi’s phrases. His solo relies on single note lines that take their time and are the antithesis of flash and ego. “Charlie’s Shorts” is another highlight. The tune demonstrates how locked in Howard and DeVore are, with their light, yet complex and active groove, providing the perfect basis for Alessi’s mix of lyrical, intervallic and runs and Granite’s more measured and careful approach. That the bass-drums tandem can simultaneously lock down a strong yet supple groove, and stay out of the way of the soloist while giving him and their listeners so much to chew on is quite impressive. “Wayne Winks at the Radio” shows off the subtlety of Granite’s writing. Beginning with a brief solo intro from Granite, it settles into a section that alternates between 5 and a lilting 6, with Alessi playing the head. Where others may have used a fast tempo to create excitement and tension, Granite did so by adding a simultaneous solo section between himself and Alessi (who has a little Dave Douglas in his playing). Both players weave in and out of each other, engage in call and response, and at times compete. A short drum solo by Howard, whose touch on the drums is quite soft, completes the soloing and sets up the return of the tune. The whole performance is episodic and develops organically. Some folks might have wished that Granite et al had opened things up a bit more and turned up the heat. I don’t, as I’m guessing that doing so would have led to an album that might have felt forced and untrue to the identity of this group. Those looking for a high octane smash-and-grab job should look elsewhere. But if you’re down for restrained and mature writing and playing from a bandleader and group with a distinct identity and point of view, definitely give Snow Umbrellas a shot. And add Avi Granite to your list of players who deserve wider recognition.